It’s the moment we’ve been waiting for! Ben Ingram, Rebecca Rider, and John Pearson kick things off in the 2014 Tournament of Champions. Here are previews of this match and of the entire tournament. Tough True Daily Double by John – you could tell he knew it but just couldn’t get it out. Still, he made an impressive comeback, and has a shot yet to win outright. Remember, there are four wild cards available to the highest scorers among non-winners. Each player has a different target in mind; this time around, mine is 14,200. If you’re unfamiliar with this concept, check out my primer on the tournament format, which includes historical wild-card cutoffs. 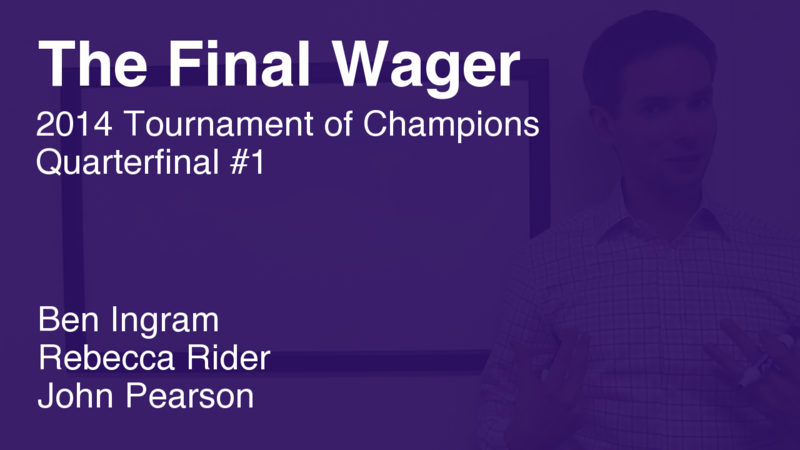 We start by looking at rational wagers. Ben should wager 701 to cover John. 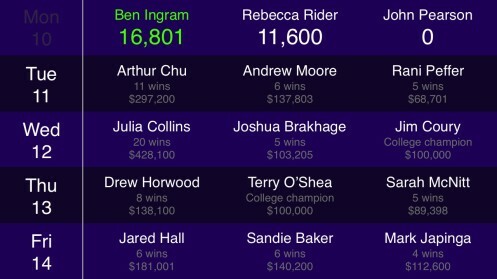 John can’t win if Ben gets it right, so to win outright, John will need a miss by Ben and a correct response of his own with a wager of at least 7,000. 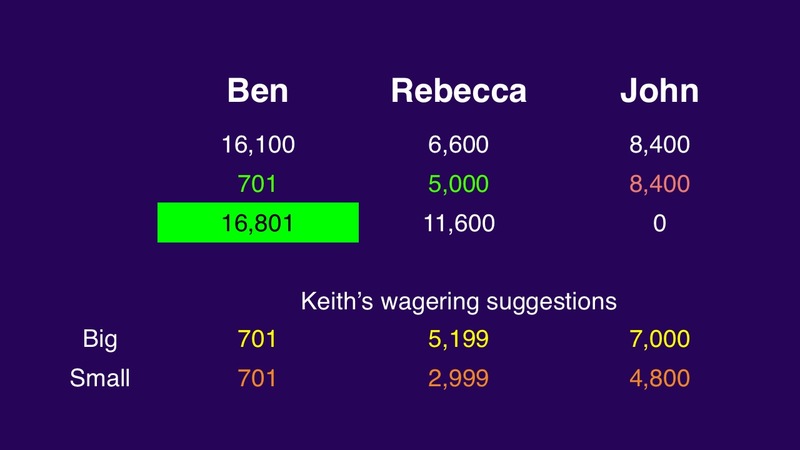 Rebecca can’t catch Ben, but if John goes for that 7,000 amount, she’ll want to cap her wager at 5,199 to finish above him. John could wager 4,800 to cover Rebecca. He can withhold the dollar because he’ll have the edge over her if they tie for second. Rebecca could wager at most 2,999 to account for this, should they both miss. Of course, she could just go for everything if she so desires. Ben is now 10/10 on Final Jeopardy! clues. I like that wager out of Rebecca; John played a good game but got stuck in two pivotal brain ruts when all of his chips were in the middle. 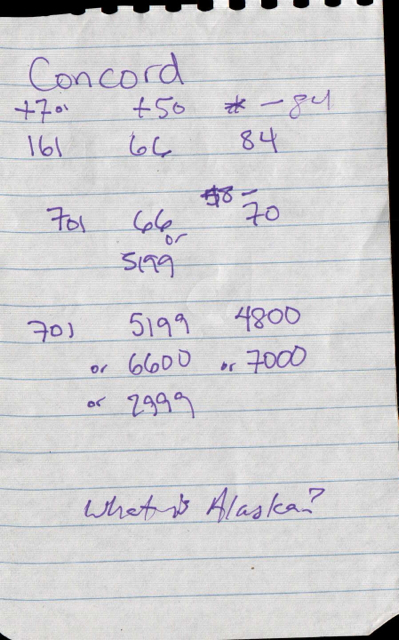 One last thing: for those of you who are interested, I’ll post my notes on the wagers as I calculated them in studio. I’m hopeful they aren’t too far off from what I find on the whiteboard. Hi Keith! Love the site, I’m trying to learn how to do the calculations myself. I have a question: for the Rule #2 calculation of the trailer’s wager, what determines if the result is the min/small or the max/big? It’s thrown me off a bit, for example on this one I thought that John had to wager min 7000, and so by Rule #3 he should wager 7700. But you had the max as 7000. Any insight would be much appreciated! Thanks and keep up the awesome site! Hey Brice – glad you’re enjoying it! Tournament quarterfinals (like this one) are slightly different from regular play, because of the wild cards, so this might not be the best example to use. Rule #2 boils down to this: if you need to get it right, that wager is your minimum (and, typically, you might as well just wager everything). If you can miss and still win, it’s your maximum.